A new species of fish has been discovered in the waters off Ireland’s West Coast. The fish, a species of chimaera (ancient relatives of sharks), was discovered when 31 specimens were spotted in a French fish market after being landed by a trawler that had been fishing in the North East Atlantic off the coast of Ireland. The new species, called the opal ghostshark (Chimaera opalescens), was described last month by French scientists in the Journal of Fish Biology. 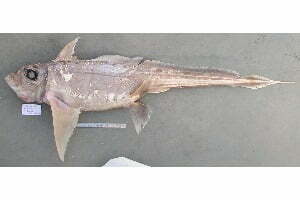 Chimaeras are cartilaginous fish in the order Chimaeriformes, known informally as ghost sharks, ratfish or rabbitfish. They are one of the oldest groups of fishes alive today. Their closest living relatives are sharks, but chimaeras branched off from sharks on the evolutionary tree around 400 million years ago. They are deep water fish, typically staying near the ocean floor at depths between 200 and 2,600 metres. Dr Declan Quigley, an expert on rare fish who works with the Sea-Fisheries Protection Authority, told the Irish Times that this is the first time in more than 100 years that a fish new to science has been discovered in Irish waters. Not a clue sorry byrne… sounds very odd. Perhaps somebody else here can help? If not I’ll do a bit of digging when I get chance, see if I can’t unearth a couple of suggestions.